The work of white South African artist William Kentridge is rooted in his opposition to apartheid. 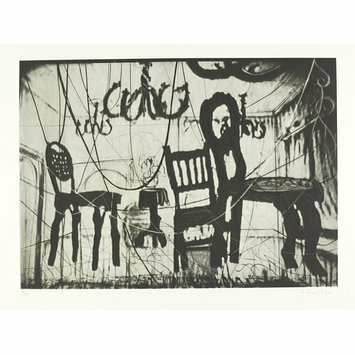 In 2002 he made a series of prints based on the novel Confessions of Zeno (1923), by Italo Svevo. One of the earliest novels to be written as if from the psychiatrist’s couch, Confessions of Zeno manifests the guilt-ridden soul that Kentridge explores in earlier works addressing the apartheid regime. The novel centres on a middle-class businessman in Trieste in the years immediately before the First World War, reduced to bankruptcy when he goes into business with his feckless brother-in-law. This impending disaster echoes the wider political one, although much of the narrative revolves around the households of Zeno and his wife’s family. In Kentridge’s series the ‘confessions’, which take the form of abstract but calligraphic lines, trail over the surface of the things described: bowler-hatted puppets (businessmen perhaps?) and weird megaphone-like instruments confront one another in empty landscapes; a lion stalks the bars of its cage. In this scene the furniture itself seems to have come alive, suggesting the powerful position that our homes and our domestic possessions hold in our lives. Scene in a room or on a stage? Three chairs and a small table. Chairs not square on the floor and two of them appear to have two legs off the floor; the legs of the third curved in a lively way. What appear to be ropes or strings hanging in loops over the front of the 'stage' and other lines drawn over the chairs, suggest writing over the main image, this enhanced by the linear patterns made by three candelabra suspended from the ceiling of the room. 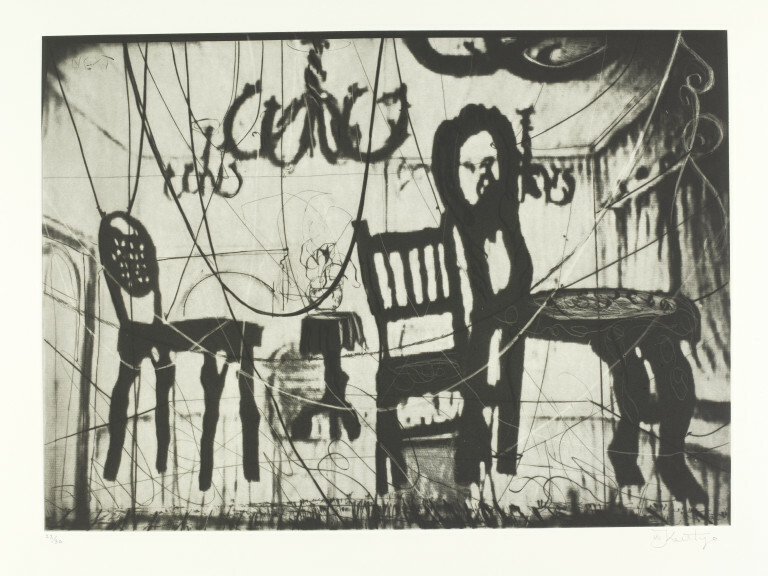 A talk on photogravure given by Randy Hemminghaus, master printer, at Witwatersrand University c.2002, to a group of local artists, inspired Kentridge to use the technique as the basis for the 'Zeno Writing' suite.